Randy was born and raised in Ohio on a small farm. As a toddler he was just a little country boy who would stand on a stool and sing his heart out for anyone who would listen. He grew up in church and gave his life to the Lord as a young boy, but as the years would pass, insecurities and shyness would take root. As a teen it would be like pulling eyeteeth for him to speak to a girl or involve himself in anything, let alone to sing for any kind of audience voluntarily. He felt the undeniable call of God on his life as a teen, but refused to pursue the call at that time. After all, how could God call Randy to preach when everyone knew he was a singer...and a shy one at that! Refusing to follow God's call can take a toll on your life. It's a long story but, over the next 30 years or so, he tried to follow God but never gave in completely. Therefore, unable to really find true happiness, he made many mistakes and followed many wrong paths for his life. Failed relationships and bad decisions ruled for many years. Finally, at the age of about 45, he realized that without God as the true center of his life, the true number one, he could never be the man who God had called him to be. It took the next several years to begin breaking all the bad habits that were formed over all those years of denial. With God's help and a lot of hard work on Randy's part, he has now finally come full circle to accept the call that had been there for all those years, willing now to sing and preach as God leads. Moving to Tulsa at the age of 50 after meeting a God fearing woman who also has the call to ministry, he now feels more at home here than any other time or any other place in his life. God has begun to open doors of ministry in many different areas. Now you will hear him say definitively that life can only work the way it should when God is in full control. This is a NEW beginning and yes, many lessons were learned as a result of all those bad choices, but now with God's help, he is anxious to share with others what he's learned so that they might have the opportunity to live their lives without making the same mistakes. Kathy was born in Tulsa, Oklahoma, January 11, 1965. Although born in complicated circumstances, God called her into the ministry, through Word and song, from the very beginning. She began singing solos at the age of two, playing the piano at the age of nine, and playing and leading worship for the church at the age of 13. At the age of 16 she began evangelizing, speaking at many churches, especially to the youth. At the age of 23, she assumed the pastorate of the church she grew up in, after her aunt and founder of the church passed away, and continued there for 15 years. Unfortunately, due to personal relationship problems, the pain became unbearable which led to a time out. The calling was still there, however, and always will be. She continued ministry via the Internet and personal contact, home Bible studies, occasional speaking engagements, and leading worship for various churches. Due to extreme emotional hurt from relationships and other wounds from abusive people, she knew it would be a long time before she could commit to a full ministry again. Her son, Joshua, was the light in the darkness and she spent several years concentrating on raising him. God continued to encourage her through various people and situations, always assuring her that the call remained. In 2007, she met Randy. Since both of them had been around the block and knew the pain of failed relationships, they understood each other completely. God knew what He was doing. 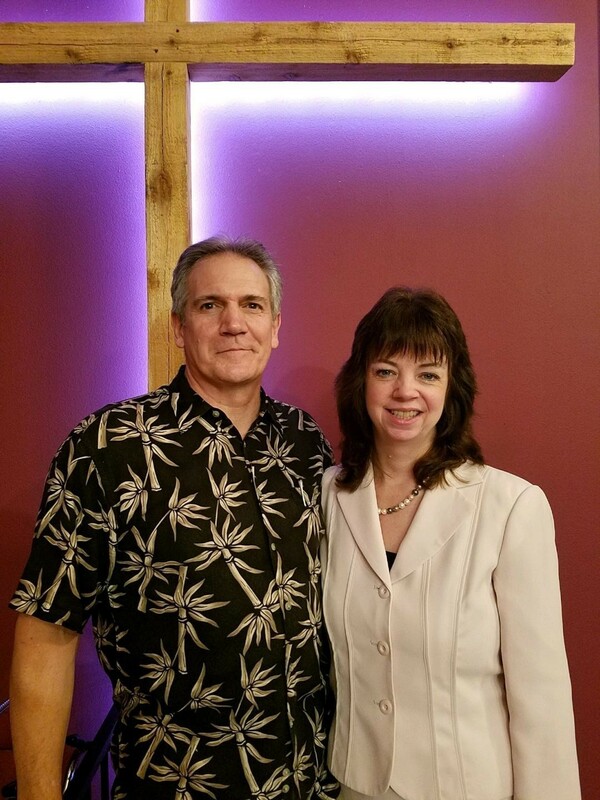 Randy had the same heartbeat for ministry, and together they knew they could accomplish everything God had called them to do, including helping others avoid the same mistakes they made regarding relationships. In May 2008, they married and continue to serve God with an emphasis on relationships and ministering to others through worship, prayer, counsel, and meeting tangible needs whenever possible. It is Kathy's desire to be the hands and feet of Jesus, meeting needs, and helping all who cross her path. "The Spirit of the Lord is on me, because he has anointed me to preach good news to the poor. He has sent me to heal the brokenhearted, to proclaim release to the captives, recovering of sight to the blind, to deliver those who are crushed." We believe in the Bible as the inspired, holy Word of God. We believe in the life, burial, and resurrection of Jesus Christ, and that every person must accept Jesus and ask forgiveness of their sins to enter the Kingdom of God. "If you declare with your mouth, 'Jesus is Lord,' and believe in your heart that God raised him from the dead, you will be saved. For it is with your heart that you believe and are justified, and it is with your mouth that you profess your faith and are saved." Romans 10:9 (NIV). "If we confess our sins, he is faithful and just and will forgive us our sins and purify us from all unrighteousness." I Peter 1:9 (NIV). We believe in following the Bible and studying scriptures to answer every question and to settle every dispute. We believe in being more than just a church building or a group of Christians sitting in our four walls. We believe God has called us to serve everyone with dignity and respect regardless of their past or their present. We believe we are to take the Gospel to all who will hear, and we are to provide the ministry of Jesus in all respects. We are here to pray, teach, encourage, feed the hungry, clothe the needy, visit those in prisons and hospitals, and allow God's love to shine through us. Period. We believe in ministering to every age group and addressing various life issues. We do not believe in church politics. We believe those in leadership should be living Godly, committed lives which should be evident in their walk with God, their conduct with their families, their church, and those they serve. We believe God is first, family is second, and serving the world around us is third. We believe everyone deserves an opportunity to know God and serve Him regardless of their past. We are not affiliated with any denomination. Open Arms is a ministry committed to following the truth of God's Word and being the hands of feet of Jesus.